“Pirates love pyjamas! Frilly ones and spotty ones, woolly ones and dotty ones! You may think you know all about pirates, how they are free, fearless and far from fancy. They are brutal and bawdy and big old bullies. But arrive on their ship just before bedtime and you will be in for a surprise. As the pirates will be getting dressed into their pretty, puck pyjamas, and starting the best kind of fight; a pillow fight! I am reading to Spike mostly every night before bed but I’m reading her Harry Potter. In addition to this I am reading to her as often as I can from a collection of picture and board books that friends and family have bought her or that I have been sent for review. Pirates in Pyjamas arrived on my doorstep from its publisher and I hadn’t really heard of it before it arrived. As I hadn’t really taken much notice of this book as me and Spike have been making our way through the picture books and stuff I thought we’d finally give it a try last weekend and wow, I fell in love! I have no clue how to review picture books and so far I’ve read some that I haven’t really known what to say about… they were just books. This one though, this was exactly what I was hoping for in a picture book. It was fun and funky and I loved each and every page, and more importantly so did Spike. She is starting to take more notice in pictures and books now she’s getting older. At 4 months she fixates on stuff and if she likes it it will keep her interest. This book did just that, she looked at each page intently and smiled as I was reading her the words. The pictures are bold and big, very big, and in all honesty pretty darn funny too. I really enjoyed it myself and I think its going to be a book me and Spike enjoy for many years to come. The story is really funny and takes everything you know of pirates and completely changes them! I loved the rhyming of the story and the way it uses language to play on the expectations. I particularly liked the way it all flowed so well that it could be spoken in a sing-song way which Spike liked, it made her laugh. While I was reading Spike’s daddy even stopped to listen and look at the pictures with her because he thought it was good too, so even if Spike doesn’t like it I think she’ll have no choice but to read it with daddy! Honestly this is my favourite picture book so far this year and I really recommend it. It will probably appeal to boys more than girls because, well society, but I think anyone with a little cheeky streak will love Pirates in Pyjamas, I know we did. 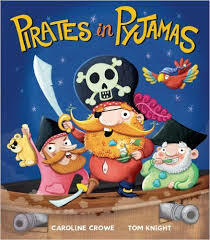 Pirates in Pyjamas was published by Little Tiger Press on August 13th 2015. My copy was sent to me from the publisher in exchange for an honest review.